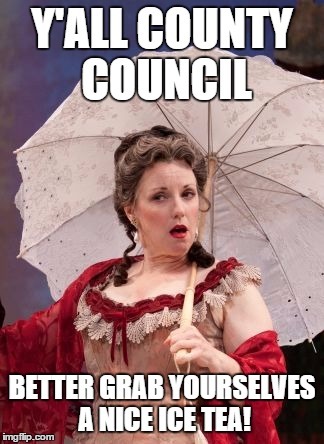 I do declare the humidity must be affecting some members of our esteemed county council. Tis the time of year when it is common to fall out from the stickiness that surrounds us like mud on a hog. Mr. Shreve in particular was a tad testier than usual. Makes us want to pull him under the shade of an old Magnolia that our great grand pappy planted back in 1907 and give him a good talking to. Alas, what difference would it really make? Why every week, before the pledge, does he do this? And notice he’s the only one. Does he not want to face the public? Does he worship at the altar of the American flag? What in a donkey’s backside is the meaning of this? Now particular to this week, Billy goes right in for the no when voting on whether or not to approve the consent agenda. On the consent agenda this week were various budget transfers for departments such as: The Child Advocacy Center, Agricultural Preservation, Housing and Community Services, Planning and Development, Fire and Rescue and Community Development. His particular beef, from what we could tell since we cannot fathom getting in that head of his, was he was really bitter about the council not approving Trout Run and still not getting his budget liaison. Logic of course dictates that he then mess with everyone else’s budget. Thankfully, Billy has no one else on board with his interesting style of governance and all budget transfers were passed 6-1. Moving on to the approval of minutes for the last three meetings. A unanimous vote! Still Billy cannot bring himself to say Aye. Must be that oppositional disorder rearing its ugly head again. A note to be made about Kirby. He did not seem to want to turn on his microphone this evening. We later discover it’s working just fine. But through all the votes we can barely hear his little “aye”. What’s up with that? On to everyone’s favorite commission: Ethics. A motion is put forth to appoint four new members. Of course Billy isn’t going to let this go without making some kind of declaration. 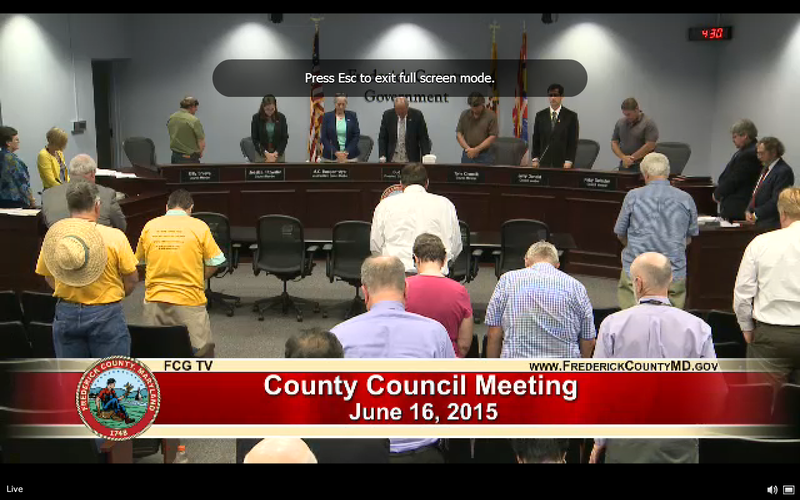 “It’s sad that 3 of the 5 members of the ethics commission resigned and we are in this position.” Really, really sad. With great poise Councilwoman Fitzwater introduced the bill and we know, just know he’s going to say something and of course he does! He insisted that we don’t have to throw out old Blainey boy’s ordinance, we can just modify it. Jessica then snaps at him (Oh the humidity, but how can we blame her? I mean really.). If you have something in writing, she quipped, you can share it with me. Right now all we are doing is reading the bill. Properly chastised he shuts the microphone down. The next order of business is something we have wanted to see happen for quite sometime. We here at the Local Yokel love our festivals. The 4th of July, In the Streets, special events at Rose Hill Manor count us in! What we do not love is seeing the mountains of trash that are full of recyclables. Our fair State passed a law requiring that all counties pass ordinances that require event organizers, within certain parameters, to provide recycling. Yay!!! Now keep in mind THIS HAS TO HAPPEN! It is a State law and Frederick County must comply. The Department of Solid Waste Management presented a lot of information to the council. And they underlined the fact that THIS HAS TO HAPPEN. Well, looky over to the left, who is going to make this difficult? 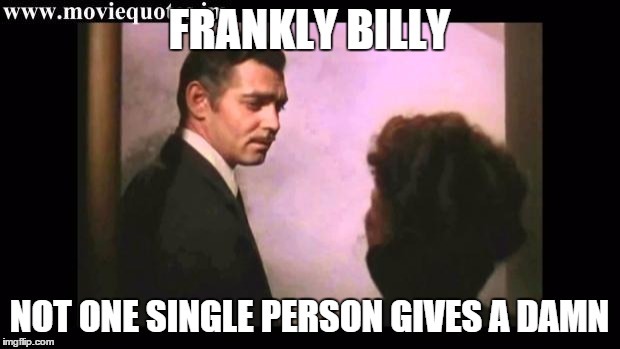 That’s right Billy. He tries to make the poor solid waste people give him an estimate as to how much recyclables would be generated at a picnic or a soccer tournament. And these poor souls. Silence falls and then a response of, “There is really no way we can estimate that.” He then wants to know what private companies charge to haul this stuff away. They don’t know. His point, I suppose, is that he thinks this will put an unfair burden on people. But hey, this isn’t for little outings. It’s for events that are expecting over 200 people and take place on public property. Why can’t this man see the big picture on this or anything else for that matter? Thankfully passed 6-1. Next oddity on the agenda. Kirby wants a lobbyist. What for? To send to Annapolis, because according to him we are missing out on millions of dollars that are either sitting in some secret bunker or being distributed to other counties. Bud rightfully asks if this is not the job of our elected delegates and state senators. Aren’t they not the ones elected to bring back money to the county? And if Kirby’s contention, for which he has no proof, is correct, then we have a problem. It was agreed that they would meet with the delegation to see if they were in fact missing out on this secret stash of cash. It was within this conversation that our good buddy Bud almost gave us a fainting spell. He called Kirby Congressman Delauter! And oh my stars do not even joke about such a thing Bud! He quickly and quite loudly added: “Sorry about that”! Wouldn’t we all be sorry indeed?